Simon Harris says he won’t be “holding off on it forever”. IRELAND MUST WAIT to ban the sale of cheap alcohol until the Northern Ireland Executive brings in similar rules, according to Health Minister Simon Harris. After a long hiatus, the Seanad debated the controversial Public Health (Alcohol) Bill 2015 for over eight hours last week. There are a number of areas the proposed legislation addresses. The bill will set out minimum pricing – prices beneath which alcohol cannot be sold. 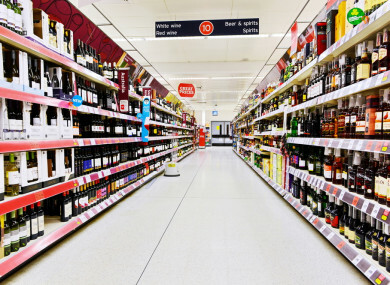 It’s believed the minimum unit pricing will effectively ban low-cost sales of alcoholic products. However, there have been reports that the measures could face a two-year delay. Harris told TheJournal.ie yesterday that it has long been government policy to introduce such measures on an “all-island basis” so as to ensure border counties are not impacted by differing regulations. The health minister said this is why Ireland has delayed the introduction of the sugar tax until April 2018, so as to ensure Northern Ireland has similar rules. He said the government has made a decision to align the introduction of minimum alcohol pricing with Northern Ireland, but said the government would have to consider it further if the political stalemate continues in the north. “I know there were moves afoot to bring in minimum unit pricing in the north,” said the minister, adding that he is going to keep up to date with the delay in getting the Northern Ireland Executive up and running and the impact it would have in delaying the new alcohol legislation under review. He said he was encouraged by last week’s debate in which he said there was cross-party support for the Bill. Despite what lobbyists in the drinks industry say, Harris said the new laws will not increase the price of the majority of alcohol products. “It won’t do what a lot in the drinks industry and those with very deep resources will claim in terms of the cost of many drinks, but what it will do is target particularly cheap brands, very high in alcohol, and I think it is a very appropriate public health policy. “My priority is to get it into a legislative basis in the Republic of Ireland, get it into law for the first time ever. In terms of when it will commence? I will consider it then, we will have to see what the situation is like in the north but we won’t be holding off on this forever either,” the minister told TheJournal.ie. Email “Ireland must wait for the North before banning the sale of cheap alcohol”. Feedback on “Ireland must wait for the North before banning the sale of cheap alcohol”.